Remove all unpopped kernels and place popped corn in a large bowl. Over medium-high heat, bring corn syrup to a boil in a heavy medium saucepan. Boil for 3 minutes, stirring slowly. Remove from heat and stir in peanut butter. Working quickly, pour peanut butter mixture over popcorn, tossing gently to coat. Allow to cool 10 minutes. Roll popcorn mixture into eighteen 2-inch balls. Press thumb firmly into center of each ball. 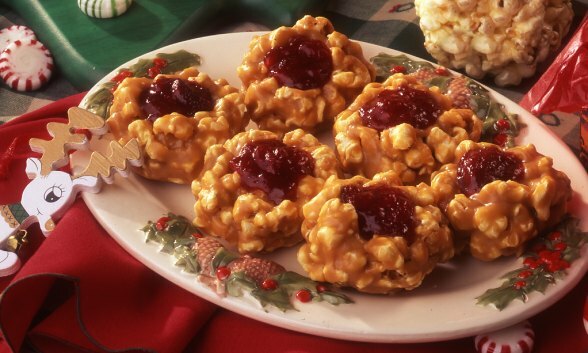 Fill each cookie center with 1/2 teaspoon jam or jelly. Store in airtight container. Variation: Substitute chocolate kisses for jam in each cookie center. Recipe courtesy of Orville Redenbacher’s® Gourmet® Popping Corn.